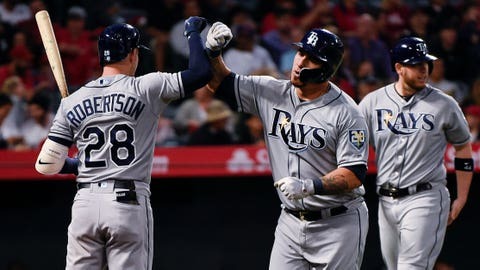 Tampa Bay Rays catcher Wilson Ramos (pictured) was selected as a starter for the AL, while Miami Marlins backstop J.T. Realmuto was named a reserve for the NL. “It’s fun. You’re playing but you’re looking around because you’re playing with all those big boys out there,” said Altuve, who made the AL team for the sixth time. Miami Marlins catcher J.T. Realmuto was tabbed as a reserve for the National League squad. “The best part is being with all the guys. You’re on the biggest stage with the best,” said Trout, who was selected for the seventh straight year — tying Boston ace Chris Sale for the longest active streak. “That’d be an unbelievable experience,” he said in an interview on ESPN. “It’s something I’ve watched for a long time. To be a part of it would be pretty cool,” Benintendi said. Markakis and Matt Kemp will join Harper in the NL outfield. Markakis has been a key performer for the Braves and made an All-Star team for the first time in his 13 major league seasons. Kemp’s return to the Los Angeles Dodgers has been a smashing success. “Having to have every team represented I think presents a bit of a problem for Major League Baseball,” Astros ace Justin Verlander said. “I think it’s not necessarily always the guys that are having the best years. I think especially in the game today where you have some teams that are tanking, I think it makes it kind of difficult.